We take a look at the downswing sequence and some golf downswing drills you can practice to perfect your technique. You’ll never hear anyone complain about the golf swing being too easy – and indeed given how long and fluid the motion is there is certainly plenty of room for things to go wrong. But for as many complicated parts as there are to a good golf swing, the fate of your shot is really determined during the downswing. Indeed, if you have ever viewed professional golf before you are probably well aware of the fact that every player takes the club back a little bit differently. Once they reach the downswing, however, the goals are always the same: to establish power, control, and precision. Today we will be taking a look at how you can improve your downswing for longer shots and lower scores. First, when does the downswing start? That’s a really good question, actually. As I said in the introduction there are plenty of parts to the golf swing, and it can be a little bit challenging telling them apart sometimes. The downswing begins immediately as the backswing ends. Traditionally, a backswing is going to take your club from the address position all the way back until the shaft is parallel to the ground. At this point, your back and hips will also turn slightly from the target. The moment you bring your club down (a transition that should occur almost seamlessly) you will have entered your downswing – a motion that utilizes all of the power and momentum established by your backswing to create beautiful and consistent shots. A good downswing is easier described then performed. While in the backswing you wind your body up so that when your club reaches the top you are prepared to deliver lots of power and torque, the downswing essentially cashes in on the work you have done leading up to it. In this regard you essentially undo your backswing. A good downswing starts with firing the hips, then your back arms and shoulders. But while you are beginning with the hips the lag between which of your body parts you are initiating is virtually non-existent. In fact, you won’t and probably should not even think about it. Once initiated, the good downswing is going to be a very smooth motion that, while quick, is never performed in haste. The goal is to build power until the momentum of the club reaches its maximum velocity at the moment of impact, at which point you will proceed to your follow through. It sounds simple, right? It is actually but for as easy as it is to learn it proportionately difficult to master. There is plenty that can go wrong in the downswing that can turn what would have been a good shot into a disaster, and that being the case let’s now look at some downswing drills and tips you can take to the course and the range that will help you attain downswing perfection. The downswing is built entirely on good temp. It sounds strange I know, given how simple tempo is to attain but indeed you could do everything else right and still not enjoy could shots if your tempo is off. Fortunately, this is also the easiest part of the swing to master. A good tempo mandates that the backswing take three times as long as the downswing. The goal here is to build power up so that you don’t waste energy on a hasty backswing that transitions into a less than impressive downswing. To ensure that your clubhead reaches its maximum speed at the moment of impact, you may find it easiest to think of a simple three word phrase as you draw the club back. “Low and slow,” was the phrase Jack Nicklaus used but anything that is similarly brief will suffice. Then, choose a short, one syllable word for your downswing, such as “fire,” or “go”. The result will be a little bit more power, and a lot more consistency. As you draw your club down towards the ball, focus on keeping your thumbs pointed up to the sky. This is a relatively simple tip that will not require extensive range time to master. The goal here is to ensure that clubhead does not release too soon. The swing thought of keeping your thumbs pointed upward on the downswing will help you to establish the much desired lag that indeed characterizes the swings of some of the games very best players. The result will be a timely release that creates powerful and consistent shots. Practicing your swing in slow motion is a great way to address a number of problems, actually. A good way to practice this drill at the range is to begin hitting shots while swinging as slow as you possibly can manage, gradually building up speed until you have resumed your typical momentum after twelve or so shots. This is going to be a great way to ingrain a good tempo into your swing, and it will also do well to help you establish a better release. The impact bag is a tool that helps give you feedback on your downswing so that you can transition to the course confident that you are doing everything right. It’s essentially a punching bag that is positioned on the ground where the ball typically would be. It’s a great tool for the range but cannot be utilized on the course. If you feel that your clubhead has reached the bag just a split moment after your hands have reached your leading leg you can be confident that your downswing is doing what you need it to. 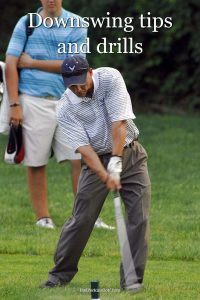 As you have hopefully seen, you really aren’t that far away from enjoying a powerful and consistent downswing. The steps one must take to master this swing component are relatively simple. Now, that said, replicating this motion over and over again on the course might be a different story but the downswing drills described above can really help to hone your swing. As with all things mastering the downswing is going to be a process so just stay calm, keep confident, and practice!